Scouting Post is back with another attempt to break down what we might see unfold during the 2016-17 NHL campaign as it pertains to the Boston Bruins. 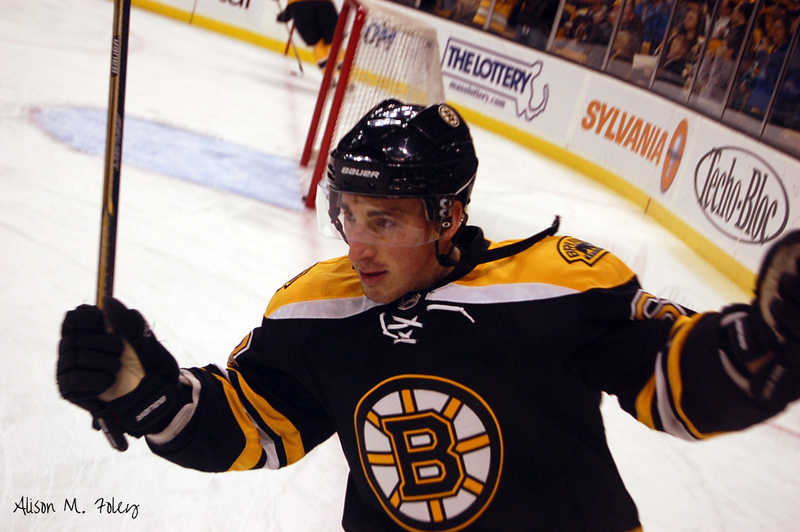 This time, we’re hitting the left wingers, and it all starts with Brad Marchand– the lil’ ball of hate & straw that stirs the goal-scoring drink for the B’s. He’s entering a contract year after coming off a career season, and I’ll break him down in detail for you in the accompanying podcast, so no real need to say more. Frank Vatrano is the player we have high hopes for in making it as the second-line LW in Boston this year. The Springfield Rifle is talented enough to do it, but it will entail accepting risk on the part of Claude Julien and Co. Can the East Longmeadow native be trusted to shoulder the load- TSP is confident he can. His impressive AHL rookie season was just the tip of the iceberg- Vatrano has the skill and moxie to make it work as a top-6 NHL forward. On the third line, Matt Beleskey is the guy, though I do go into more about his value contract-wise and what he means to the B’s. I’m sold on Beleskey for the myriad little things he does on and off the ice, but I won’t argue with those who feel that the team isn’t getting enough bang for the buck on his deal. Ultimately, they could do much worse, but if he can improve on his 15 goals and 37 points from a year ago, that would be welcome news indeed. The fourth line is pretty wide open, and my guess is that Tim Schaller has the inside track. The Merrimack, N.H. native has the size and enough big league ability to be a capable bookend along with Riley Nash over on the right side. He’s listed as a center, but if he’s not going to play in the middle, LW makes a lot of sense for the former undrafted free agent out of Buffalo. Zac Rinaldo…we hardly knew ye! Well, he’s still hanging around, but my guess is not for much longer. That leaves a host of other aspiring young players vying for spots on this Boston Bruins club, and I run through just about all of them- from the young pros like Colton Hargrove and Anton Blidh, to new blood AHL options like Jake DeBrusk and Peter Cehlarik. Jesse Gabrielle will be fighting (literally?) to make an impression, and he looked jacked (in a good way) when I saw him in Buffalo for draft weekend. When he’s playing like someone possessed, opponents need to keep their heads on a swivel…he can wreck it on the scoreboard and on the physical side. He’ll have his hands full trying to win a spot on this NHL team given the lack of options the B’s have, but watch for Gabrielle to open up some eyes this month- he took a major step forward last year. Ryan Fitzgerald isn’t there because he’s entering his senior year at Boston College, but he’s a Swiss Army Knife kind of pro projected player, and he’s going to do some impressive scoring work up on Chestnut Hill this season after breaking out as a junior. Let’s not forget a couple of undrafted camp invites in Matt Mistele (I pronounce it for you on the podcast)- a 6th-round pick of the Kings in 2014 who didn’t sign and has been a pretty major disappointment since potting 34 goals in the OHL as a 16-17-year-old prior to his draft year. He’s big and talented, but doesn’t use his size and brings inconsistent effort- sounds like he might just fit right in. Simon Stransky is the other as a WHL player this past season who put up a point-per-game with the Prince Albert Raiders and distinguished himself as a playmaking winger with top hockey sense, yet never got a draft call. Both will get an opportunity to show their potential and earn an NHL contract, but in the podcast- we’ll explain why just signing one or both is not as simple as declaring it a must on Twitter and Bruins internet message boards. There are other undrafted/unsigned/ forwards and rookie defensemen in Boston on an invitational basis for the rookie camp portion, but not going to cover them here. Thanks for reading and listening…keeping this one short and pithy because the pod comes in at around 50 minutes. Enjoy the Winger intro and the Primus outro. This is the last installment of the position-by-position look at the Boston Bruins as we enter the new NHL season- training camps are less than a month away. Thanks for reading and passing the links to the other pieces on the goalies, defensemen and centers. There is more to come on the blog as the season goes on, but here’s a breakdown of the team’s situation on the left and right wings. In retrospect: Scoring was down across the board, as Milan Lucic and Reilly Smith combined for just 31 goals between them after posting 44 the season before. Both players have new zip codes for the new year, as the Bruins and GM Don Sweeney have attempted to generate some flexibility with the salary cap in sending them to Los Angeles and Florida respectively. Brad Marchand and Loui Eriksson are the only Boston wingers who surpassed the 20-goal mark last season, as Marchand led the club with 24. Eriksson, who has been much-maligned after being the central return piece in the Tyler Seguin trade on July 4, 2013, bounced back with a solid 22-goal year after dealing with two concussions and just 10 goals in his first full Boston campaign. Rookie David Pastrnak was a bright spot, electrifying the fan base in his second NHL call-up in January when he posted back-to-back 2-goal games and earned a job with the big club the rest of the way, finishing with 10 goals and 27 points, while leading the team in scoring over the final quarter season stretch. Fellow Providence kiddo Seth Griffith showed some flashes of offense when called up earlier in the year, but a lack of speed and experience saw him returned to the farm for more seasoning. Former top-10 selection Brett Connolly was brought in at the deadline and suffered a freak finger injury in his very first Bruins practice, causing him to miss all but the final five games. One can only wonder if his presence might have helped the team eke out a win somewhere along the line before he got back into the lineup at admittedly less than 100 percent. The Simon Gagne veteran redemption experiment did not work, and Daniel Paille 6 goals in 71 games was his worst output since coming to the B’s early in the 2009-10 season. Gagne retired and Paille is still looking for a new team after not being re-signed. The view from here: Marchand is the team’s most consistent finisher, having tallied at least 20 goals in each of his five full NHL seasons with the exception of the lockout-shortened 2012-13 year, but even then he scored 18 in just 45 games. The small but fleet-of-foot agitator can be his own worst enemy, and he will go long stretches without scoring, only to get hot and carry the team for extended periods. Streaky play aside, Marchand has the bona fides as an important contributor who will continue to get the ice time and could hit 30 goals this year. 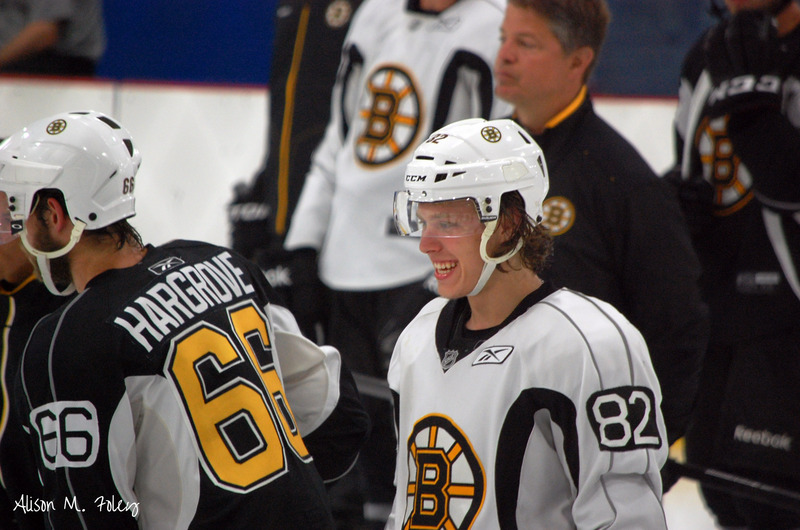 Pastrnak is the player the Bruins have been waiting for. The 25th overall pick in 2014 dazzled in development camp immediately after the draft in Philly, the first indication that Boston had a steal. You can never really account for why players like him drop, but the B’s were major beneficiaries, as they had him projected in the mid-teens but after being unable to move up to get him (sensing a trend here? Trading up is much more easier said than done- takes two to tango) they stood pat and got him at their regular spot anyway. He’s not only highly skilled, but extremely hard working and energetic. Cynical Boston fans will grumble about waiting for the inevitable trade that is coming to unload the young star as was the case with Seguin and Dougie Hamilton, but Pastrnak is not going anywhere. In him, Boston has their next Patrice Bergeron in terms of a player who not only has the talent to be a front line guy, but who embodies the team-first, competitive values the organization treasures. Boston signed free agent Matt Beleskey away from Anaheim in the off-season, getting him at five years and an AAV of $3.8M- not a cheap contract, but less than what prognosticators thought he might receive on the open market heading into July. At 27, he’s in his prime and coming off of a career-best 22 goals for the Ducks in 65 games, but does not have an established body of work as a scorer at the NHL level and has dealt with injuries consistently in his pro career. He’s done and said all the right things since signing with Boston and the Bruins are banking on him getting another 20+ markers while bringing an energy and physicality despite not being an overly big, classic power forward. Another new addition who does fit the mold of the modern big wing with scoring potential is Dorchester’s Jimmy Hayes, who comes home to play for the team he dreamed of skating for as a kid. Although not your snarly, intimidating presence, the former Boston College star tallied 19 goals the old fashioned way- in front of the net where he parks his 6-5 body and uses his quick hands and offensive instincts to finish off scoring chances. The 25-year-old signed a three-year extension with the B’s after being acquired for Reilly Smith with an AAV of $2.3 million, a bargain if he maintains his production or better yet, ups his numbers into the 20’s. He has talent enough to do it, though he doesn’t have the skill and upside of his younger brother and Rangers forward Kevin. Eriksson once scored 30 goals in a season, but that’s not who he is. The Bruins got a glimpse more in line with the real forward this past season, and if he brings more of the same, the team will take it. His lack of open-ice speed is the biggest drawback to the veteran Swede, who is a quiet professional and uses his smarts to slip through seams and generate stealthy scoring chances that won’t bring you out of your seat, but count just as much as a highlight reel goal if it goes in. His 18:24 average time on ice led all Boston forwards and speaks to his ability to compete on both special teams and at even strength. Because he’s always going to be compared to Seguin, Eriksson is an easy target for frustrated fans, but he did his job last season and will be counted on again. Given his impending status as a UFA, however, if the team looks out of it as the trade deadline looms, he’s a prime candidate to be moved. Connolly is an intriguing x-factor as a right wing who just couldn’t find his niche in Tampa Bay after GM Steve Yzerman made him his first ever draft pick, sixth overall, in 2010. At the time, Connolly had been dealing with a major hip injury and was seen as an injury risk that early in the draft despite being a gifted scorer coming out of Prince George of the WHL. Ironically enough, Connolly’s hip has held up since then, but the expected offense has not materialized to the degree indicative of his high pre-draft standing and subsequent projections. He scored 12 goals in 50 games for Tampa Bay in a bottom-six line role, so the potential is there, and the B’s feel that giving up a pair of 2nd round picks- in 2015 and 2016- is worth the risk. Veterans Chris Kelly and Max Talbot are back to vie for playing time on the lower lines and Claude Julien will value their experience and leadership. Both are in the final years of their contracts and may not be back in Boston for the 2016-17 season, so the team will see what they can get from them this year and take it from there. If he is unable to win a job at center, the Bruins would be well-served to see if they can get Alexander Khokhlachev out on the wing and try him in a top-9 role. Spots are getting more and more crowded, but the team does not have many more forwards with the pure talent and scoring potential Koko does. A lot of fans fell in love with him without realizing how much work the rest of his game needed, so the appetite to have him in the lineup has been pretty constant since 2011. Now, though, is really time to see what they have in him. The B’s struggled to score last year and that’s what this kid does best. Unlike Spooner, he doesn’t have the speed to be an ideal center, so why not see if he can make the adjustment to wing? It’s worth a shot. Youngsters Brian Ferlin and Seth Griffith will also hope to get more playing time in Boston during the new campaign. Griffith shined at times, including scoring several memorable goals, and has always been a dangerous offensive player going back to his OHL days with London, even if he does not have ideal size or game-breaking wheels. Ferlin is a big-bodied forward who did not look out of place in a seven-game NHL audition (1 assist), but may have to start the year in Providence if there are no injuries to open up spots up front to begin the year. In what really amounts to Sweeney’s most curious and criticized move, he dealt a 2017 third-round pick for Zac Rinaldo, one of the most polarizing players for the way he plays on the edge and has received suspensions for illegal hits and putting opponents at risk for injury. Rinaldo is undersized, but plays a kamikaze style that opens him up to injury and also leaves the penalty box door ajar as well given his 102 penalty minutes a year ago. On the positive side, he’ll hit anything and plays with an energy most players can’t hope to match, but a perceived lack of respect for his fellow NHLers, not to mention just 1 goal in 58 games has a lot of Boston fans not seeing the sense in trading a top-90 pick for a player like Rinaldo. We’ll have to see whether he can reign in his emotions and be more than he’s been in his NHL career to date with the Flyers or if this will go down as a step backwards for Sweeney in his early tenure. On the farm: The B’s signed 2013 late-rounder Anton Blidh, and he’ll turn some heads in Providence with his gritty, in-your-face style. Although I try to avoid comparisons, he plays a style reminiscent of old Boston farm hand (and part-time Bruin until his trade to St. Louis) Vladimir Sobotka. What Blidh lacks in skill, he makes up for in “want to” so watch for him to become a fan favorite with the skill set to come up and provide help in a pinch. Big winger Colton Hargrove will provide some toughness with Tyler Randell after turning pro out of Western Michigan. The Texan showed offensive improvement every year with the Broncos, and he was a nasty fighter in the USHL with Fargo before the NCAA. He’ll likely embrace a policeman’s role similar to Randell, but don’t expect much in the way of production as he adjusts to the pace and demands of the pro game and schedule. Anthony Camara has been a disappointment in two pro seasons after being a third-round pick in 2011. As much a victim of internet hype without context, he’s a gritty player who likes to hit, but who does not have the requisite hockey sense to be a front line player and needs more talented linemates to produce. This is probably his last chance to get it going in the Boston system. Brandon DeFazio and Frank Vatrano provide the ability to score goals on the wings for Providence as neither figure to be favorites to earn spots in Boston out of camp. Vatrano, who hails from East Longmeadow, Mass., has a wicked shot and made a lot of strides in improving his conditioning. He’s someone to keep an eye out as a player who played just one full season at UMass before deciding to make a run with the hometown team. Free agent Colby Cave could see time at center in Providence, but a move to the wing might suit the gritty, smart and underrated scorer nicely. He can push the pace with his skating and he brings a tenacious style that coaches love. Watch for him to earn Bruce Cassidy’s trust early and often, even if he doesn’t project as a high-end player in the NHL. The future: Jake DeBrusk and Zach Senyshyn were the team’s top two draft selections, but left wing Danton Heinen is the player to watch in the nearer term. The 2014 fourth-rounder out of the Surrey Eagles of the BCHL made an immediate impact at Denver University, finishing with the third-best freshman point totals in the nation. He’s a smart, creative playmaking wing, who showed a consistent ability to make plays around the net even without elite skating ability. He’s shifty and quick, but his mature game and a knack for setting up plays and making it look easy could see him turn pro as soon as this spring if he takes another step forward in his development with the Pioneers. DeBrusk scored 42 goals with Swift Current and will likely need time to physically mature back in the Dub, but he brings a sniper’s mindset and an eagerness to be a Bruin that makes it none too surprising that the club jumped on him early in the draft at 14th. Like DeBrusk, Senyshyn has a natural ability to find the back of the net- he’s under pressure to justify his high draft standing but has the demeanor to see it through. Time will tell if the Bruins have it right with this duo, but there is no rush to figure it out this season. Jesse Gabrielle, the club’s fourth-round selection in 2015, grew up in Western Canada cheering for the Bruins and Marchand. Now with Prince George of the WHL, he’s got some Marchand in him. He’ll have to prove that he can maintain his production and consistency while remaining dedicated to working towards an eventual job in Boston. Rising Notre Dame sophomore Anders Bjork looked good in this month’s Team USA WJC national evaluation camp in Lake Placid. Watch for the 2014 fifth-round pick to make that squad as a versatile, effective two-way forward who brings speed and penalty killing chops to any team he’s on. Slovak winger Peter Cehlarik will give one more year in the Swedish Hockey League a try before he’s expected to come over and compete for an NHL roster spot. The tall, lanky third rounder two years ago has a good release and offensive ability, but is not all that heavy a player nor does he play with much attention to detail for a 200-foot game. He’s skilled, but leaves you wanting more at times when it comes to his energy and hustle. The verdict: It’s a middle tier collection of wingers, with not a single player coming off a year of 25 or more goals. There is some promise with this group, and the Bruins will need it as major steps back by key contributors means that there isn’t much depth to pick it up behind them. The Beleskey and Hayes additions were solid roster moves, but losing Lucic is going to hurt more than Bruins fans realize until they start watching the games. It’s kind of like that old Cinderella song- “Don’t Know What Ya Got Til It’s Gone”- and fans will have to decide on their own if the contract/UFA debate was worth losing him. Given the return, it probably was, but it’s going to take some getting used to when he’s skating around in a Kings sweater this season, likely playing some of his best hockey in years. It’s only human nature, after all. Pastrnak is the key- the Bruins need to put him in situations where he can thrive while preserving his health. Don’t expect All-Star caliber numbers, but 20+ goals and north of 50 points as a sophomore would be a win and show that he is well on his way. Still, there are more lingering questions about this group than answers- the only way to settle the debate is by playing the games.